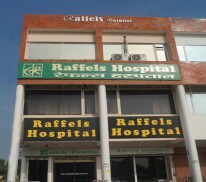 Raffels Hospital is Multi-Specialty and Super-Specialty Hospital located in Sector-14 Panchkula. 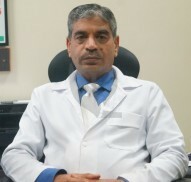 This Hospital is a joint venture of highly experienced Orthopaedic Surgeons namely Dr. M S Gupta (MS Ortho, FASIF Germany, AOAA Swiss, Ex-Registrar Edinburgh University UK, fellow in Joint replacements from Germany, Australia & Thailand and Guest Speaker of UTMB University Galveston USA) and Dr. Pradeep Aggarwal (MS Ortho Gold medalist from DMC, Ludhiana and Balraj Sahni National Awardee). Both the promoters are distinguished Orthopaedic surgeons of region serving people for more than 25 years. Raffels Hospital is a state-of-art hospital with highly trained and motivated medical staff providing world-class, innovative care in a friendly, compassionate homely environment conducive to patient recuperation. Raffels Hospital offers a wide array of treatments and service for both children & adults, covering knee joint replacement with computer navigation through small Incision leading to more precision eliminating chances of human error. It manages trauma cases, spine surgery, and arthroscopic surgery of knee joint for meniscus and ligament injuries. Dedicated trauma services are available around the clock for Fracture cases including poly trauma which is managed by latest techniques and best implants. Raffels Hospital is fully air-conditioned 30 bedded state of the art Hospital equipped with highly specialized Critical Care Unit which provides an unrivalled level of acute care and support for medical patients & complex surgical cases. We strive to allow flexible visiting, to provide privacy and best healing environment. Similarly, the Intensive Care Unit (I.C.U.) in the Hospital is amongst the best in the country, fitted with the latest equipment and being managed by the respected and nationally renowned doctors (Intensivists). Promoters of the hospital are determined to give the best care to the patients and continuously organize training programs for the doctor and nurses to enhance their skill-set comparable to the international standards. Raffels Hospital is boon not only to the people of the tri-city but also to Haryana, Himachal Pradesh, Punjab and various other parts of India.